Perhaps bubbles and blisters have bombarded the car’s glossy coat, and you’re considering repainting the car. But do you really have to repaint it? Let’s get one thing straight – if the clear coat peeling affects the entire car or most of the car, a repaint is necessary. However, if the problem is only affecting a small section of the paint job, say the hood or one of the doors, then it’s unnecessary to spend all that money and time on a repaint. In this article, you will learn several DIY methods of repairing a peeling clear coat. The method you use will depend on the degree of damage on the surface of the car. For instance, the clear coat might be peeling away but the paint job remains intact, or the paint job may be damaged as well. If the clear coat is peeling, but the paint is in good condition, then you will only need to replace the coat on the affected area. There are two possible scenarios; either the clear coat is peeling away, or it’s totally peeled. If there’s still some clear coat on the affected area, start with step I below but if the clear coat is totally gone, then skip to step II. Get 100-grit sandpaper and use it to scrub the affected area in circular motions. It’s advisable that you scrub a little past the damage, sanding out some of the clear coat that’s still intact. How is the paint below the clear coat? In case it is still in great condition, avoid sanding the clear coat hard so you can avoid removing it along with the clear coat. There needs to be a smooth transition between the affected clear coat and the unaffected clear coat when the repair exercise is done. To make that happen, you will need to do some wet sanding on the boundary. Get 2000-grit sandpaper and soak it in a water-soap mixture for about an hour and use it to grit the transition area. Be sure to wet the sandpaper frequently so there’s sufficient lubrication between it and the surface of the car. Use some rubbing alcohol or glass cleaner and a solvent-based paint prep cleaner to clean the section you just sanded. Use a fine-grit scuffing pad (you can buy this from an auto parts shop) rub the cleaned section. The goal is to make the paint’s texture a bit rough. Once you’re done with that, use some more rubbing alcohol to clean the area. Use an easily-removable masking tape to tape off the area you’re working on. You’re going to tape off all around the work area but make the radius a little past the edges of the damaged area. You can reduce the tape’s adhesiveness by sticking it to another surface and peeing it away twice. Feel free to extend the protective tape on the outside if you don’t want the clear coat landing on the unaffected parts. Shake the aerosol can before use and ensure that you read the instructions on the can to make certain that you’re spraying correctly. Move your hand as you spray and focus on spraying evenly all over the affected surface. Allow the spray the recommended amount of time to dry; this is mostly 5 minutes. Sometimes, the direction on the can will require you to wet sand the coat lightly with a 2000 or 3000 grit sandpaper. Observe the directions and when you’re done, use a soft clean cloth to wipe off the resulting dust. See Also: How big air compressor you need? In most cases, it is recommended that you apply two coat layers but again, there should be some directions on the can regarding the number of coats to apply. So, hoping that you allowed the first coat to dry, apply the second coat and give it a few moments to dry as well. Once the coat is dry, remove the masking tape and let the car sit there overnight or for at least 8 hours so the clear coat becomes adequately firm. After that, it’s time to match the rectified area up to the surrounding area that was okay. To do that, sand the repaired area lightly with a 2000 or 3000-grit sandpaper. Afterward, use a buffer pad to apply a polishing compound to the repaired area so it totally blends in with its surroundings. Has the peeling of the clear coat led to the color coat fading, peeling or scratching? Then you will need to replace the color coat as well. Let’s go over the process. There should be a tag in your that indicates the vehicle’s color code. This is normally placed below the latch of the driver’s door, in the trunk or beneath the hood. Can’t find the tag in the car? You’ll most likely find on the internet. All you need to do is go to the manufacturer’s website (or other info websites) and search the car’s color code by the vehicle’s make, model, and year. If all these fail, go to an auto parts dealer or a qualified mechanic and they will help you pinpoint the right color code. We’re assuming you’re looking for the most convenient options. So, go for an all-in-one touch up kit that comes with all the tools needed, including tack cloths, cleaners, sandpapers, and pigmented and clear sprays. When ordering a touch-up kit, ensure it matches with your car’s factory color code. if you have much time then go to near detailing shop and collect them. If you bought a kit, it came with a few sandpapers; take the one with the heaviest grit, say 200, and use it to sand the affected area. Use the tack cloths and the cleaners included to clean the area. After that, tape off the area as directed in the kit. You could also tape it off using masking tape, and by the way, remember to reduce the adhesiveness of the tape by sticking and peeling it twice from a different surface. Most of the time, 3 is the ideal number of primer coats you should apply but again, your kit should direct you on that. Let each primer coat dry, scuff the dry coat lightly with a fine-grit sandpaper, and wipe the particles away with a tack cloth before applying the next one. Typically, 3 pigment coats are applied but be sure to check your kit or can for recommendations on that. Remember to allow each coat to dry and sand and clean it with a dry cloth before applying the next coat. While applying the coat, try as much as possible to maintain evenness. The kit or can should come with instructions on the ideal technique of application. Oh, and by the way, ensure the working area is properly ventilated so you’re not inhaling the spray too much. You will likely apply several clear coat layers, perhaps two or three, based on the kit’s or can’s directions. Be sure to allow each coat to dry and wet-sand it with 2000-grit sandpaper. Once you’re done applying the clear coats, let them dry for around 8 hours before moving on to the next step. You need the area you just repaired to blend in with the surrounding areas, right? So, use a fine-grit sandpaper, like a 2000 or 3000 to scuff the area lightly then work on it with a moisturized buffer pad and polishing compound. While sanding the clear coat or the color coat, you will obviously be releasing chemical-filled fumes and dust particles, and you shouldn’t ignore these. To protect yourself from these chemicals, ensure there’s fresh air circulating freely through the work area. You might not want to repair the peeling clear coat outdoors, as there can be too many unfavorable conditions like sunshine, dust and debris in the air, and more. The best place would, hence, be your garage. Just ensure the windows and doors are open for the air to get in freely. If you can add a fan in there, the ventilation would be even better. Protect your eyes from the chemicals by wearing some goggles. The last thing you want is for the chemical-filled dust to get into your lungs. Therefore, get an activated charcoal face mask and put it on while working on the car. A surgical mask isn’t a very good option as the chemicals will still get into your body. 1. What leads the clear coat to peel? There are various reasons why your clear coat could be peeling. The most common ones include a poor paint job and exposure to direct sunlight for extended periods. Failing to apply wax or applying it incorrectly also causes the clear coat to peel. 2. How can I prevent the clear coat from peeling? Don’t expose the car to direct sunlight for too long; always try parking it in a shaded area. Another way would be to ensure the car is properly waxed a few times per year with high-grade car wax. If the paint needs to be applied, make sure it is applied correctly, preferably by an expert. 3. How do I fix a clear coat and restore the sheen? Sand the peeling areas and spray new clear coat, then apply the polish and the wax. 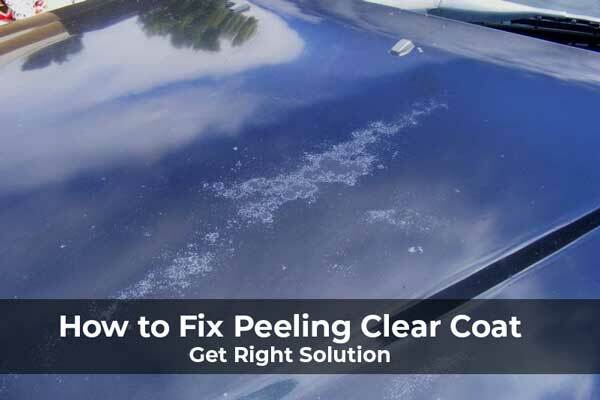 So, that’s all folks; we hope this article has provided you with all the info you needed to be able to repair a car’s peeling clear coat. As you use the products needed for the task, like the cleaning products or the color coat spray, try following the instructions indicated on the products. For instance, while one clear coat spray may direct you to apply 2 layers, another may recommend 3 layers. Also, different brands recommend different drying times, preparation steps, and spraying techniques. We wish you the best as you undertake the DIY task of repairing your peeling clear coat. Found this article helpful? Why not share it with your social media friends?